Brake cylinders ex-Booths July 2009 brake cylinder progress: our most common starting point, ex-Class 37 brake cylinders recovered from C.F. Booths. These four were burnt off and are gamble purchases. 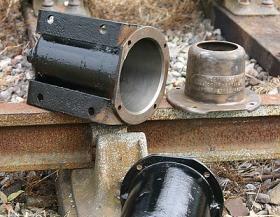 Most we remove are split apart and inspected before purchase. 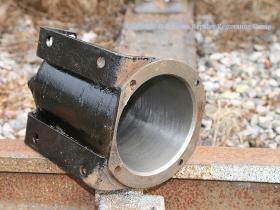 July 2009 brake cylinder progress: our most common starting point, ex-Class 37 brake cylinders recovered from C.F. Booths. These four were burnt off and are gamble purchases. Most we remove are split apart and inspected before purchase. Chris Bodell painting a brake cylinder cap Chris Bodell is seen painting the outside of one of the brake cylinder end caps on 19th July 2009. 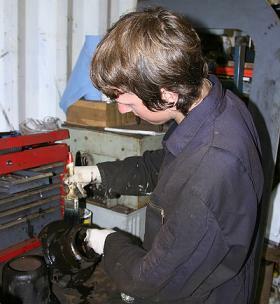 Chris Bodell is seen painting the outside of one of the brake cylinder end caps on 19th July 2009. Brake cylinder outer cases refurbished Cleaned, passed and painted cylinder cases and end caps. July 2009. Cleaned, passed and painted cylinder cases and end caps. July 2009. Overhauled brake cylinder Close up showing the desired interior finish. July 2009. Close up showing the desired interior finish. July 2009. Brake cylinder and cap Close up showing a cleaned end cap, complete with Westinghouse plate, also interior finish of the cylinder. July 2009. 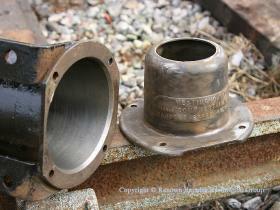 Close up showing a cleaned end cap, complete with Westinghouse plate, also interior finish of the cylinder. July 2009. 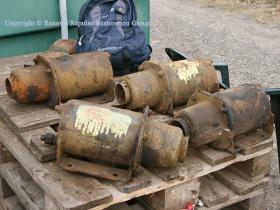 Two brake cylinders and cap Two valuable re-usable brake cylinders. July 2009. 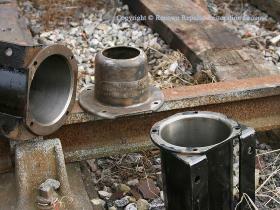 Two valuable re-usable brake cylinders. July 2009.